As expected in some quarters ex Harrier Mark Yates was finally announced as the new Harriers manager today. He steps into the shoes recently vacated by Stuart Watkiss and even more recently by the caretaker manager, Martin O'Connor, who will be remaining at Aggborough for the foreseeable future. Mark, until last night the first team coach at Championship side Burnley, has already started shaping his back room staff by bringing his former Cheltenham team mate Neil Howarth in as his right-hand man from AFC Telford. He is not expected to enter the transfer market and spend the 'substantial' sum of money promised by the board until he has had a good look at the existing squad. Yatesy first arrived at Aggborough in August 1994 after being released by Doncaster Rovers. Bought here by former manager Graham Allner he soon became the team captain but was never a real favourite with the fans, mainly due to his poor passing and a fiery temper that saw him being given a yellow card more often than not. He finally left for Cheltenham five years later in 1999 after making more than 230 appearances for us. In his time at Whaddon Road he teamed up with their manager Steve Cotterill and started to take his coaching badges. When Cotterill left to manage Burnley Graham Allner then became manager at Cheltenham for a while but then left to be replaced by Bobby Gould, after a while Yates also left the club after failing to get on with the dour Welshman and arrived back at Aggborough for a second spell. At first many fans didn't want him back, citing his attitude towards Harriers fans whenever we played and beat the Robins but he soon won them over with his 'never say die' performances for us. 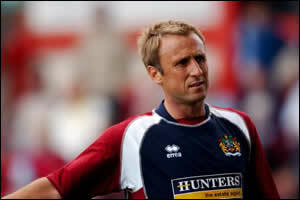 He was released at the end of the 03-04 season and joined up with Cotterill at Burnley as their reserve team coach. Judging by some of the Clarets fans comments it seems he was well liked up in Lancashire but they accept that the chance to become a manager at a club nearer his home in Hartlebury was a chance not to be turned down. Mark will be taking charge of his first game at Woking tomorrow. Commenting on the choice of manager the Harriers board said today, after a long meeting on Thursday evening, that Yates' 'hunger for the club' was his biggest selling point and no compensation will need to be paid to either AFC Telford or Burnley as a result of the new arrivals. Both clubs' Chairmen have agreed to release them from their respective contracts. Chairman Barry Norgrove confirmed that 'a substantial' amount of money will be made available for Yates to spend in the January Transfer Window, though the exact amount will not be made official. One can only assume from that last comment that Yates will need to be able to fund his own transfer pot to a certain extent by some pruning of higher earning players. Commenting on his appointment Yatesy said "It was an easy decision for me in the end really, this is what I want to do. Some will ask whether I've allowed my heart to rule my head over the decision to leave Burnley for this Manager's job but I don't see it like that. For me this is a challenge and something I need to do. I've been involved in the coaching side of things for a while now and I want to try and succeed at the sharper end of the scale. When you look at the league table you have to say that at the moment we're on the verge of being involved in a bit of a fight at the bottom but the only thing we can do is to start winning matches and get ourselves up a little higher. I'll be working 100% and I'll give it my all, I can assure you of that, and I'll ask for no less from the players. I'm not going to make any wild predictions as to whether I want to win the league this season, next season, or anything like that. The most important thing is that we get ourselves settled and we move onwards to the future, I want to help move the club forward. There's plenty of quality in this squad at the moment and it's now a question of picking up the first three points tomorrow." Harriers Online wish Mark the best of luck in what will be a very difficult task and also thank Martin O'Connor for having a valiant stab at shaking this moribund lot up. No easy job.